While appearing on MSNBC, Mayor Michael Nutter referred to Trayvon Martin's death as an "assassination"
With the one-month anniversary of Trayvon Martin’s death only a day away, Mayor Michael Nutter expressed strong views regarding the incident that has garnered national attention. I’ve called this nothing short of an assassination. There was no reason for that individual, Zimmerman, to do what he did. Trayvon was not doing anything and was not a threat, based on all the information and evidence and 911 tapes that have been released. It was incomprehensible to me why an individual would do something like this unless he had something else either in his heart or on his mind. 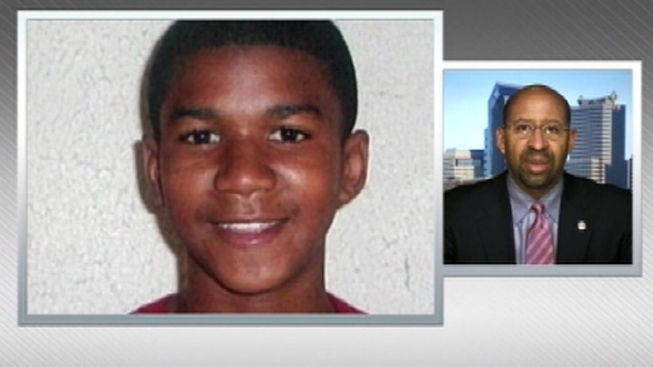 He, the individual Zimmerman, followed Trayvon, for some period of time. Trayvon was not a threat to him, he wasn’t doing anything to him. Here’s the young boy out, he had skittles and a bottle of iced tea. Clearly Zimmerman was told not to continue any kind of pursuit. That’s what the police are for if you have that kind of incident. So in my view at least, he tracked him down, he followed him and then shot and killed him. I said what I said, I meant what I said because I do feel that strongly about it. The police down in that city certainly need to get to the bottom of it, and I know that there are a number of investigations…We need to know what happened, why it happened, why this individual has not yet been arrested almost a month to the day of this incredible tragedy. He’s still running around free and Trayvon Martin is dead. On February 26, 17-year-old Trayvon Martin was shot and killed by a neighborhood watch volunteer in the gated community of Sanford, Florida. “This guy looks like he’s up to no good or he’s on drugs or something,” said Zimmerman to the officer. Zimmerman also said he had been following Martin which police told him not to do. The two then got into an altercation which resulted in Martin dying from a gunshot wound to the chest. The circumstances leading up to that confrontation have been heavily disputed. Zimmerman was armed with a 9 millimeter handgun while Martin was unarmed. The teen was found with only a bag of Skittles and a can of iced tea. Zimmerman told police that he acted in self-defense after Martin attacked him. He has not been arrested. The Florida State attorney and the FBI are now investigating the case while a Grand Jury will launch a new investigation next month. The Sanford Police Department has also received massive criticism for not arresting and charging Zimmerman. Florida Police Chief Bill Lee defended the department’s decision by referring to Florida’s “Stand your ground” law which states that Florida residents have the right to use force if they feel they are being threatened. Zimmerman’s attorney also claims his client suffered a broken nose and a gash to the back of his head. He also denied accusations that Zimmerman was a racist. Critics claim however that Zimmerman was the clear aggressor in the situation. The attorney for Martin’s family says that testimony from the teen’s girlfriend refutes Zimmerman’s claim that Martin attacked him. The attorney says Martin’s girlfriend spoke to him on the phone moments before his death. According to the attorney, the girlfriend claimed Martin told her he was being followed by Zimmerman and was trying to run away. Last Friday thousands of Philadelphia residents took to the streets to show support for Martin’s family during “The Million Hoodie March.” The participants marched from 30th Street Station and down John F. Kennedy Boulevard to Love Park. The marchers wore hooded sweatshirts in honor of Martin, who wore one at the time of his death.